A team of scientists has been using the latest space technology, combined with ground measurements, to assess the health of one of the nation’s most important sources of underground water, a large aquifer system located in California’s San Joaquin Valley. The team, comprised of School of Earth and Space Exploration researchers Chandrakanta Ojha, Susanna Werth, and Manoochehr Shirzaei, focused on the San Joaquin Valley’s most recent drought period, from 2012 to 2015, measuring both groundwater loss and aquifer storage loss. The results of their findings have been recently published in the Journal of Geophysical Research. 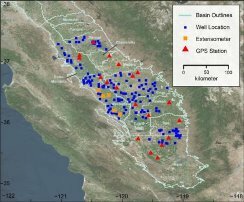 With the hope of providing water resource managers with better tools to help keep aquifers healthy, the research team is developing new observation techniques to monitor groundwater and storage capacity of this important California aquifer. They are using a unique combination of data from the NASA GRACE satellites, the Global Navigation Satellite System (GNSS), Interferometric Synthetic Aperture Radar (InSAR) from the European Space Agency’s Sentinel 1 satellite, extensometers, and ground level records. The results of the recent study, which is a follow up to their 2018 published research on the 2007-2010 drought in California’s Central Valley, show an alarming loss of ground water each year of the 2012-2105 drought and, more importantly, an overall permanent loss of storage capacity in the San Joaquin Valley aquifer.